Hero Arts clear cupcake stamp set and old wood mount sentiment. Nesties label one and tag, Imaginese Paper. SU! 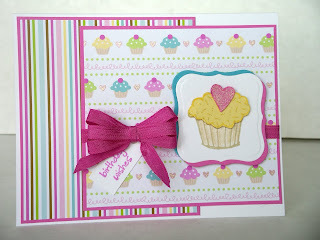 paper for the card base, image/sentiment, matting, cupcake frosting and heart. Don't know who the ribbon is by, but used my 'bow easy' for the triple bow. Love the triple bow. Very cute card. I know that paper..it is so festive and cute. Darling!